Boiling Irish music down into just ten CDs is impossible, but if you're a beginner, you've got to start somewhere, right? These excellent albums might be just the introduction you're looking for. If you're already a big Irish music fan and you don't happen to have any of these in your collection, what are you waiting for? The Chieftains are perhaps the best-known traditional Irish group among American listeners, having been around the longest, played the most places, and sold the most records. They're known for performing with special guests, from Elvis Costello to Tom Jones to Willie Nelson, but Water From the Well is them at their best: playing straight-up Irish tunes with just a few well-selected guests, all of whom come from the Irish tradition. This debut album by Planxty was released in 1972 and really redefined how the folk music community perceived Irish music. Prior to that, folky and clean-cut balladeers like The Clancy Brothers and The Dubliners owned the scene, and Planxty's rough-and-tumble style was both fun and tantalizingly authentic. This was not music for the Lawrence Welk crowd; this was stuff to drink Guinness by! Some of the songs on this album were traditional folk songs, to begin with, and those that were written at the time have entered the repertoire on their own, easily standing the test of time. This 2000 album by Solas, who are probably the most popular Irish music group of the modern generation, is a particularly good one for those just starting in on Irish music and who might not be so into a CD of straight-ahead old-style tunes. While it does contain several old-school jigs and reels, many of the songs on The Hour Before Dawn are more on the folk-rock edge of the contemporary traditional Irish spectrum, making it quite accessible a new listener. Among the notable tracks on this album is Solas's fiddle-laden version of the song "I Will Remember You," which Solas member Seamus Egan co-wrote with Sarah McLachlan. This is a classic album from favorite group Altan. The group members hail primarily from Northern Ireland, which adds a subtly different flavor to their music. This album contains a nice combination of fiery upbeat tunes and mournful but beautiful ballads. Lunasa, who take their name from an ancient Celtic harvest festival are an instrumental powerhouse who've recorded a number of fantastic albums over the years, through various iterations of band members. This album really highlights their relaxed, jam-laden sound. Irish traditional music had been primarily dominated by men until the formation of the all-female Irish-American group Cherish the Ladies, who are known for their tough, hard-driving sound and their luscious feminine vocals. This album is a great representation of their easy-to-love sound. Teada plays very straight-ahead traditional Irish music, and are in fact probably the most stylistically traditional of anyone on this list. 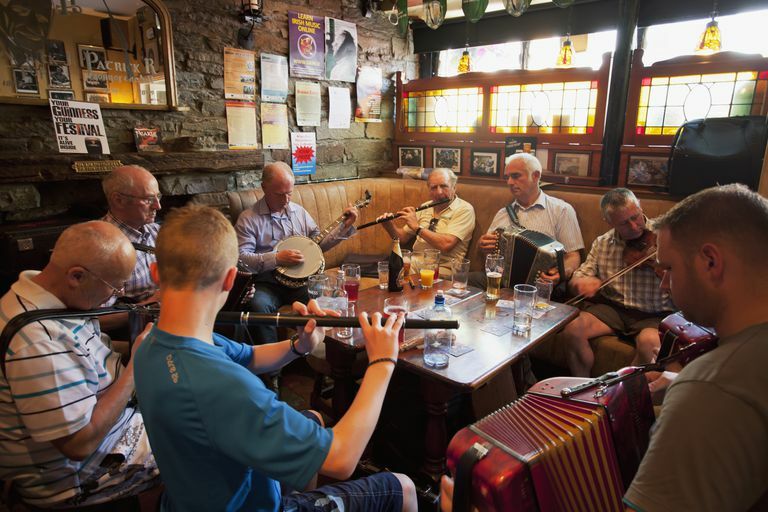 Jigs, reels, hornpipes, slides—this is the grand old stuff, and it's played beautifully and cleanly by these fine fellows, making it an easy listen even for a beginner. The Bothy Band was started by bouzouki player Donal Lunny after he left the aforementioned Planxty, and carried on in that vein of rough-and-tumble semi-traditionalism. Great stuff, this (especially the electrifying Tommy Peoples on fiddle), and among the most influential Irish music albums ever recorded. Burke is a true musician's musician—or fiddler's fiddler, to be exact. Virtuosic without being overly fussy, he all but burns up the strings on a huge variety of County Sligo-style songs. Several of the songs feature other musicians, including members of the Bothy band, of which Burke was a member. However, the truly noteworthy tunes are simply Burke and his fiddle. Muireann Nic Amhlaoibh (pronounced MWEE-run Nik OWL-level) came to international prominence when she joined the wonderful and well-known Irish group Danu. Her rich contralto shines on this collection of Irish ballads—primarily old, Gaelic-language ones, but also a few well-chosen modern ringers. This is a great starter CD for those who are interested in exploring more Irish balladry, particularly the women's tradition. What is an Irish Music Reel?